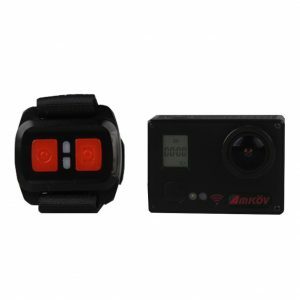 Amkov is renowned for its innovative stream of action cameras. 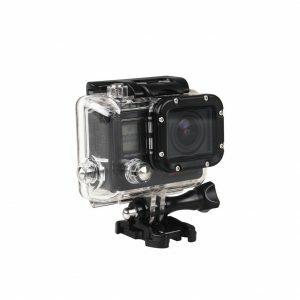 The AMK7000S is yet another popular action camera from the AMK family. The Amkov AMK7000S comes along with Wi-Fi connectivity and “4K Capability”, a proficiency that was lacking in AMK 5000S. The innovative and improved image sensor as well as the remote-control support provided, marks AMK7000S apart from its previous versions. This camera made it to my list of the best action cameras under $100. Here we have provided a detailed review about this fantastic product so let’s get started already! There isn’t much difference in the core design of the AMK7000S from its predecessor AMK5000S. Similar as before, a good-quality and tensile plastic material is used. However, the frame mount needs to be bend to its maximum extension in order to fit it around the camera. It’s practically impossible to recharge the battery via the micro USB port when the camera is present in the frame since the opening of the port is too small. The waterproof case seems to trouble a bit as well. After I noticed a minor dot on the lens, I tried my best to rub it off with a cloth but to no avail. Hence, it was actually an issue with the plastic. We can only hope that it’s an issue with this piece’s camera rather than an overall manufacturing defect in all AMK7000S waterproof cases. Although the menu provides a wide range of options, the main issue is that you can only navigate with merely three buttons provided. This means that you can choose options with the shutter button, switch pages with the on/off button or go down with the help of Wi-Fi button. Moreover, you can’t change the pages unless you have reached the bottom of the whole context menu. The video quality is splendid at day-time and you can view sharp details from a distant point. But, the camera seems to lose its superiority during night time. It gives an utter black view during night. Although the camera provides you with 4K Resolution capability, the frame rate decreases prominently to 10fps that is totally impractical for a wide majority of people. The Amkov originates with the OmniVision OV4689 CMOS sensor but the matter of concern is that this sensor doesn’t succeed in producing the sharp 20MP photos as being claimed by the specifications. In fact, the 4MP photos don’t seem to have much distinction from the 20MP photos. All being said, the AMKOV 7000S does produce decent-quality images with a colorful interface. The battery power depends on the resolution being used and the no. of pixels employed in forming an image. The battery power is expectedly consumed more when working with higher resolution images. Frame rate also plays a crucial role in determining the battery expenditure. All videos are normally recorded at a frame rate between 25-30 fps. Consequently, the battery power consumed is directly proportional to the frame rate employed. Fortunately, the battery timing of the AMK7000S is really outstanding for all the resolutions and frame rates. Most users normally use a combination of 1080p+60fps and 1080p+30fps. The 1.5-2 hours’ duration for battery is quite an exceptional one and a bright aspect of AMK7000S. Apart from the WiFi accessibility provided, a remote control is also offered by the Amkov AMK7000S. Basically, it comprises of a wristband offering two buttons, Videos and Photos. There isn’t a specific need to pair the device with the camera in order to use it. Users might experience some problem in operating the device while the camera is rotated upwards. The Amkov AMK7000S follows the same strategy as other cameras and offers an exclusive app for both Android and iOS operating systems. With the help of this app, users can see a live view from their camera. The app also offers additional functionalities such as shooting photos or videos as well as changing the exposure, resolution, date-stamp and controlling the video time lapse duration. Another feature of this app allows you to switch between modes. The WiFi functionality operates quite well however the brief range support might create some issues. It seems to function appropriately if the distance between your smart device and the camera is not more than 20 inches (about 50 cm). If the two devices get more distant, the connection becomes unstable and users might experience some video lags. Overall, the application is extremely user-friendly and easy to use and provides you with all the necessary options and features. The AMKOV AMK7000S has an innovative edge over the previous version in terms of the 4K resolution camera. However, a few things should be taken into account while considering this 4K resolution aspect. Firstly, the maximum resolution recorded by the camera is 3840 x 2160. Some would argue that the true 4K resolution is 4096 x 2180. Nonetheless, the Consumer Technology Association (CTA) brands this as 4K ultra HD. Previously, this was considered to be Quad Full HD or simply QFHD on account of the fact that it doubled the resolution known as HD i.e 1920 x 1080 and successfully preserves the 16:9 aspect ratio. To sum up, almost all the action cameras in the market today claim their 3840 x 2160 resolution as 4K resolution so the AMK7000S can be considered as no exception to the lot. The Amkov AMK7000S is a complete innovative package with good technical specifications. The wristband remote control, various resolutions and the 20 MP sensor, all for less than a $100 does seem to be an appealing package in case you can’t afford a GoPro camera. However, some minor lags and technical problems are to be considered as well. The small microUSB port doesn’t allow the frame mount to fit rightly into it whereas the Wifi can only function within a short range. The menu is really difficult to handle with only three buttons and the minor dot on the waterproof case seemed to be a flaw that can’t be neglected. The firmware v.9.12 needs refining to unleash the actual potential of this camera so that it can truly prove to be a valuable product in the tech camera industry today. Nonetheless, hopefully Amkov will review and address all these minor flaws and pay attention to these small details and we will witness the next version to be an even better version of this exceptional action camera series! !